Special occasion dinners can be memorable for many reasons. Perhaps the artistically plated tapas at a swanky new restaurant made an impression or the view while cracking crabs by the bay at sunset was simply unforgettable. Sometimes, however, a special dinner is less about what’s on the plate or where it’s enjoyed than the particular sentiment that goes into the preparation. Before having children, my husband and I usually went out for dinner on Valentine’s Day. Eventually, however, my husband’s job required him to travel most work weeks. That, of course, meant a lot of restaurant fare, and with two sons in the picture, we all looked forward to a family meal when he returned. It became apparent that fancy clothes and reservations weren’t the backbone of a special dinner. Of course, I absolutely enjoy eating out, but I also relish the family time around the kitchen table. Over the years, family dinners have been as much a source of general catching up and serious discussion as they have been of silly jokes, random trivia, and perplexing brainteasers. I also like to add an occasional helping of quirkiness to the actual meal. Meatloaf “cake” on April Fool’s Day, stuffed peppers that look like jack-o-lanterns for Halloween, and this amusing spin on chicken for Valentine’s Day. No special recipe is needed for this craftily cut boneless breast of chicken. 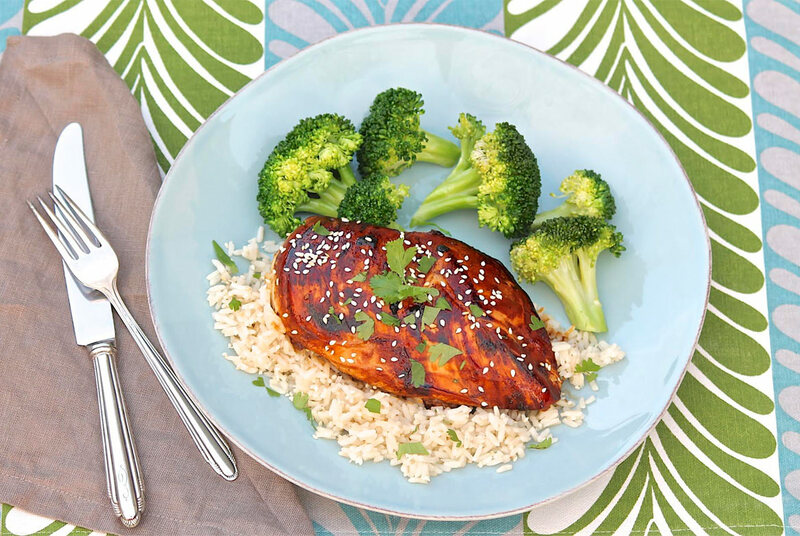 Your favorite marinade, spice rub, or a quick brush of barbecue sauce add flavor, but kids and adults will likely be most impressed that you’ve lovingly fashioned the protein on their plate in the shape of a heart. 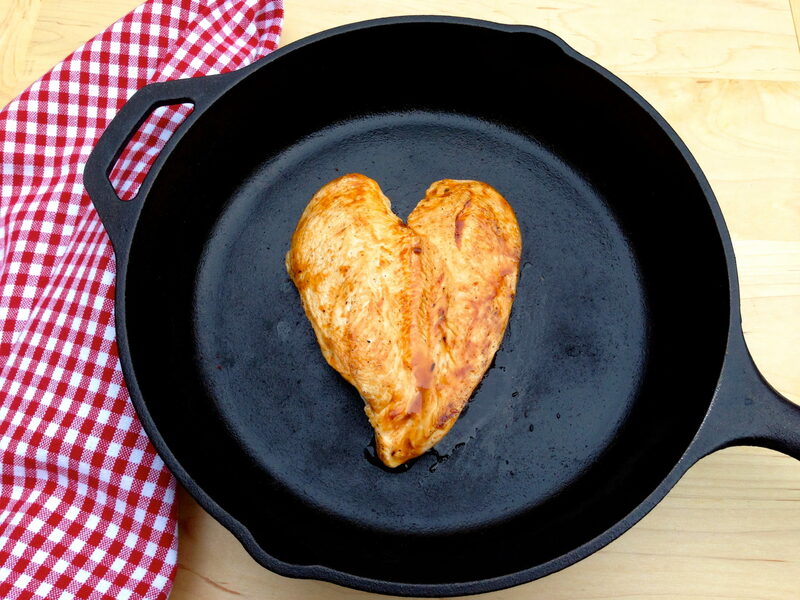 And though perfect for Valentine’s Day, heart-shaped chicken is an ideal way to perk up an otherwise ordinary dinner any time of the year. I’m quite sure that adding a measure of fun to the food makes it taste better, too. I’ve made Heart Chicken several times with the recipe for Pat’s Seared Sesame Chicken. It’s easy and everyone here loves it! If you are using a rub, sprinkle it over both sides of the breast. If you are using chicken that you have marinated, remove it from the marinade. Heat an oiled skillet over medium to medium-high heat. When hot, place the chicken breast, tender side facing up, and cook for about 3 minutes. Then, flip and cook for 3-5 minutes, depending on the size of the breast, or until the chicken is just cooked through the center. If you are using barbecue sauce, baste both sides of the cooked chicken with the sauce and flip a few times in the hot skillet to caramelize the sauce a bit. Serve with love to smiling faces! It was truly my pleasure, Beth. I am all about making fast and healthy food in one’s own kitchen and, sometimes, a great prepared product can make that happen. When it is made with a passion for quality ingredients as well as taste, all the better! This sauce is like homemade…just made in your kitchen instead of mine!